A toilet trap, or trapway, is a curving channel inside the base of a toilet that leads from the hole at the bottom of the bowl to the drain pipe. When a toilet backs up and the clog did not occur in the drain pipe, the stoppage usually exists in the trap. You can determine whether a clog is in the toilet’s trap or further down in the drain by checking the sink and/or tub drains. Toilets, bathroom sinks, and tubs almost always drain out into the same main drain pipe, so if the sink or tub is draining without a problem, then the clog most likely lies in the toilet's trap. Most toilet clogs can be cleared using a toilet plunger (not a regular cup-shaped plunger). Failing that, that next thing to try is a toilet auger, a special type of plumbing drain snake designed for toilets. Anything from tissues to paper towels to hygiene products can cause a toilet trap to clog. These items should never be flushed down the toilet. 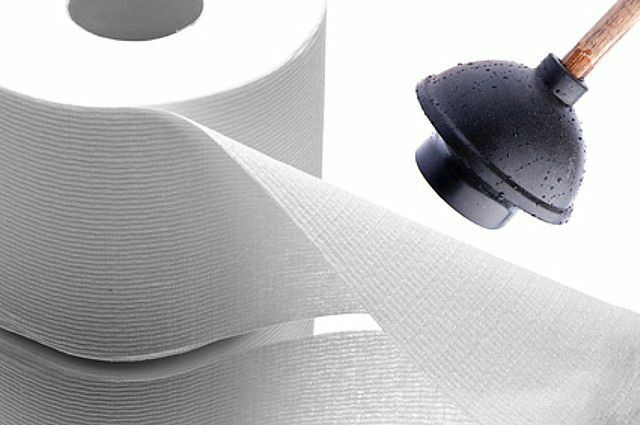 Disposable wipes, even those labeled as "flushable," also should never be flushed because they do not break down easily when wet, like toilet paper does. If you have small children, you're probably familiar with kids' preoccupation with the toilet. Flushed toys are very common causes of clogs in traps. Even some adults, who might be afraid to touch toilet water, may attempt to flush items accidentally dropped into the toilet rather than fishing them out. Plunging is effective for clearing most paper-related clogs, even tough ones, so it's the best method to try first. If plunging doesn't work, you may have a hard object creating the stoppage and should move to a toilet auger. For the best results, use a toilet plunger, also called a flange plunger, rather than a standard sink plunger. A toilet plunger has a bell-shaped cup with an extendable flange that fits into the hole in toilet bowl to create a good seal. Make sure there is enough water in the toilet bowl to fill the cup of the plunger and seal around the cup when it is placed over the hole. Set the plunger into the water of the bowl so the plunger cup is at an angle. This allows the cup to fill with water, which increases the plunging force. Press the cup over the hole to create a seal. Carefully pump the plunger in and out with an even but vigorous motion while maintaining the cup's seal over the hole. The plunging action forces water in both directions in the drain, in a sort of push-pull motion, to loosen the clog. Plunge five or six times, then pull up the plunger and see if the clog has cleared. Repeat step 3 as needed. If you can't clear the clog after ten or so attempts, it's probably time to try an auger. A toilet auger, also called a closet auger, consists of a J-shaped tube and a cable that's turned by a handle. It works the same way as a drain snake, but the tube allows you to feed the cable into the trap while protecting the toilet bowl from damage. You can buy a toilet auger at hardware stores and home centers for less than $15. Pull out the auger handle all the way so only the tip of the cable is showing at the bottom end of the tube. Insert the end of the tube as far as it will go into the hole of the toilet bowl. Slowly push the handle down (toward the tube) while cranking the cable clockwise. This forces the cable into the trap, and the cranking helps the end of the cable move through the trap bends. Keep cranking and pushing the cable until the handle contacts the tube and the cable can go no further. Pull the cable back out through the tube. Repeat the process three or four times, forcing the tube and cable to the left and the right to ensure that the obstruction is completely cleared.